An increasingly hot day today, and a special one for Paul - it was his birthday. 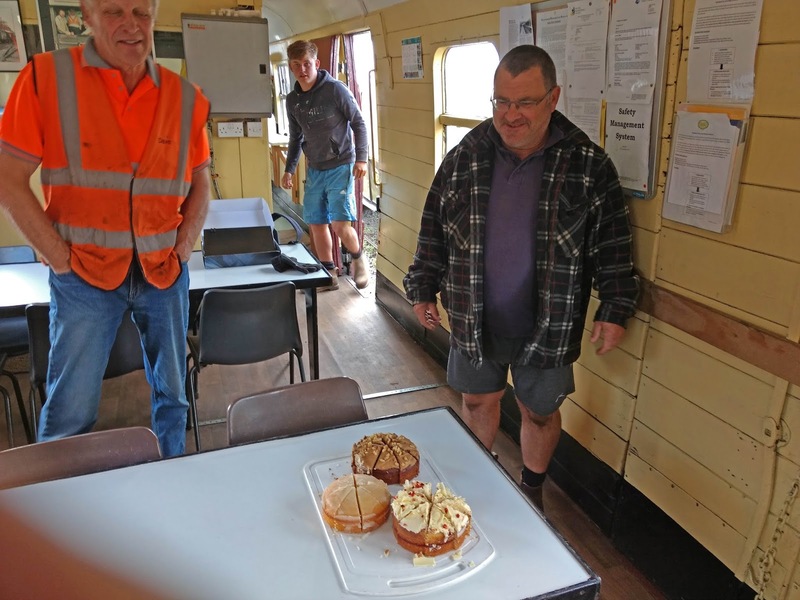 Gone were the doughnuts he would bring, to be replaced by three delicious looking cakes. These proved to be extremely popular, with some barely able to contain themselves, even though they had only popped in for a quick morning cuppa with us. Soon a group of us surrounded the cakes, but no one made a move. We talked about the weather, King Edward II, our trip next week to the NYMR, anything at all - the cakes were the elephant in the room. We will pass by the ugly scene here with the cakes, once the ice was broken... the cakes did not last long. It was a mercy killing, they would not last well in this heat. Then, to work. We were a hearty group of 20 today, and split into 4 groups. Come and join us, go on ! 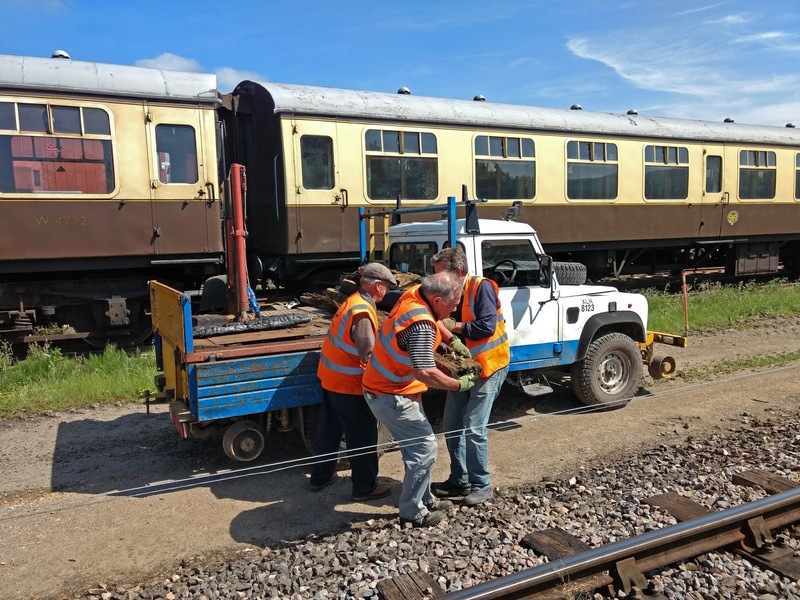 - Two groups repaired track defects. One continued from last week at Stanton, while a second worked north from Chicken Curve. 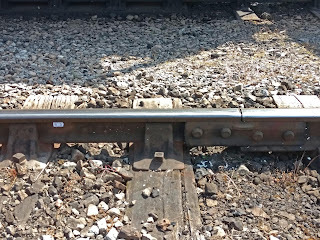 - A small group repaired to Broadway to further distribute excess ballast. - The fourth group tidied up the leftovers from the Saturday gang changing sleepers in the C&W siding. 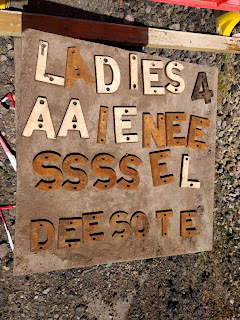 The leftovers consisted of rotten sleepers and chairs. 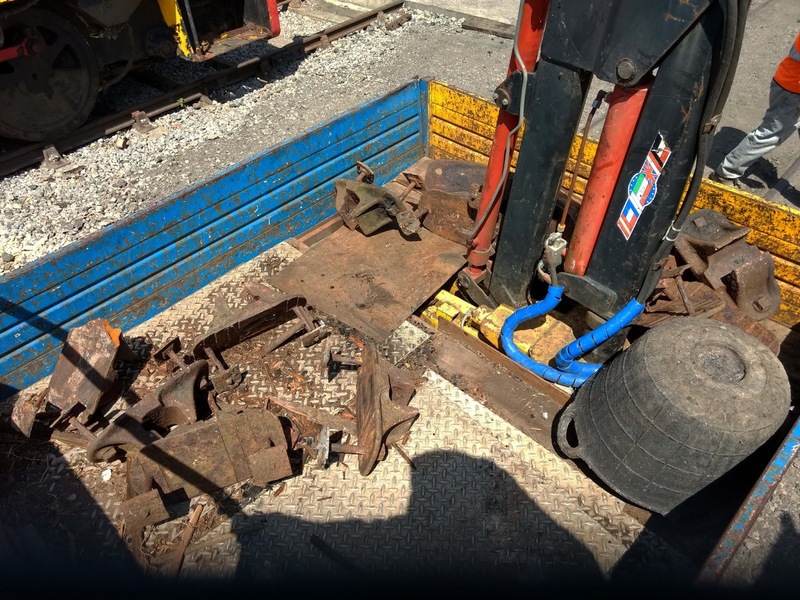 These were heaved over the running line and on to the Landie. Although the sleepers were perfectly rotten, some were very heavy as they still had chairs attached. Very awkward to load, they are. They needed a hefty push and a heave to get them on. Our friendly royal visitor was the only kettle today, the DMU forming the second train on today's blue timetable. Blue - how fitting for this particular piece of motive power. Blue, blue, our world is blue... remember that one? 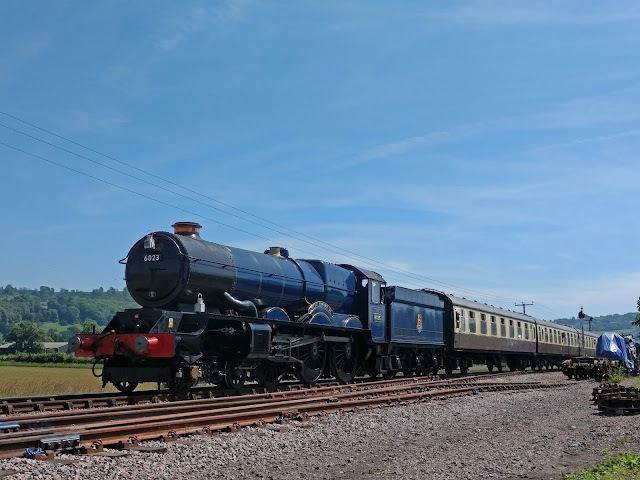 Here His Majesty rolls into Winchcombe, where the token is exchanged for the next one with the signalman. 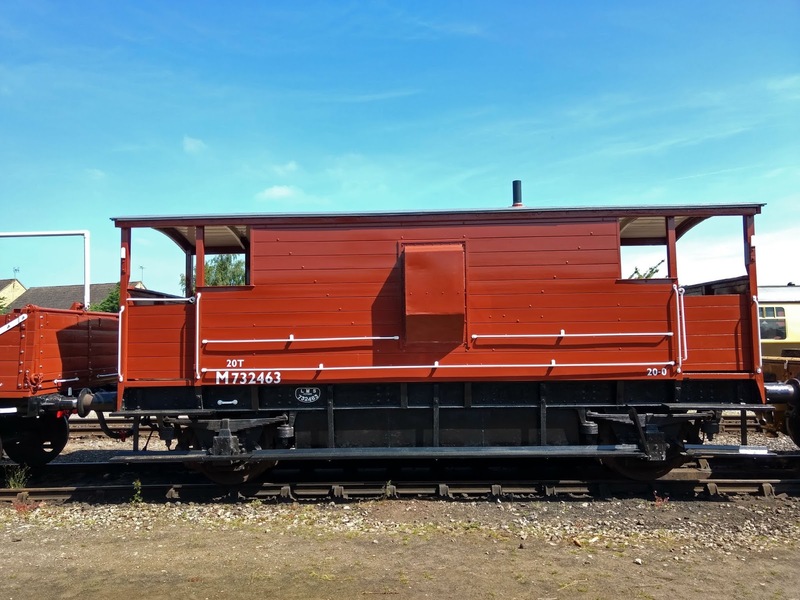 Walking back through the yard, we were impressed by two recently outshopped goods wagons. Didn't C&W do well with these? 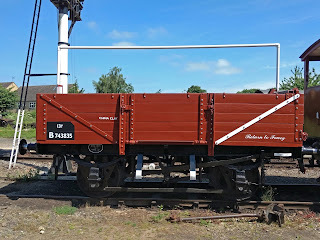 This is a china clay wagon, marked 'Return to Fowey'. 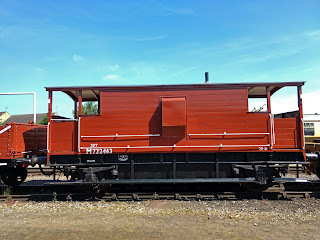 Then, this brake van. 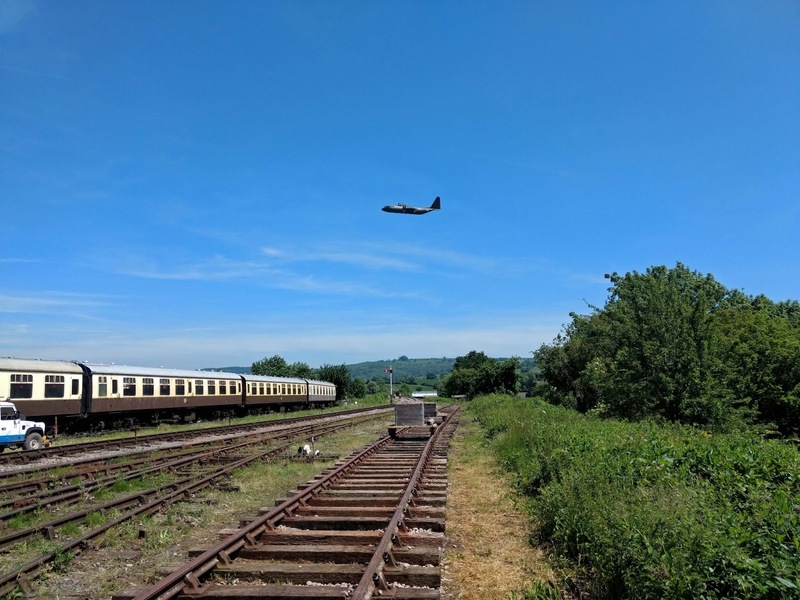 There may be others on the railway, but the only one that has been in service the last few years was the Shark. This one looks neat as a new pin. 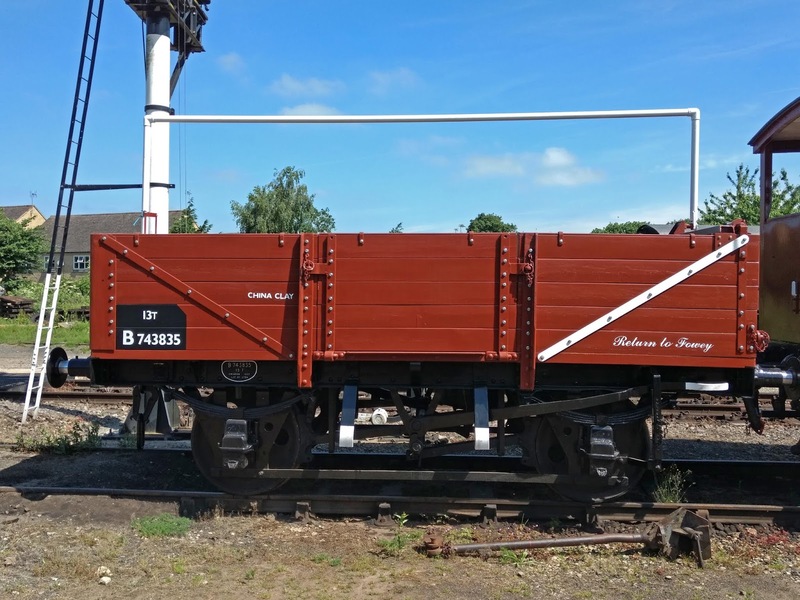 Another brake van was under repair, but unfortunately the camera would not favour us with a photograph, although we did press the button.... it's chassis was recently painted black, while the bodywork, very tatty, looked like a big job, but nothing our C&W team can't handle. There was a rumour that it came from a garden a year ago? How interesting is that! 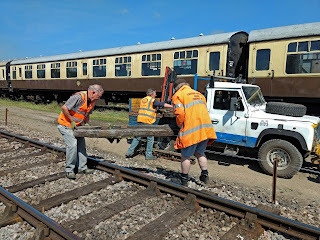 Next came a piece of good news: the trusty lads at B&S, pouring all that concrete, had discovered a small tray in the back of their shed containing a number of priceless 4 inch GWR letters. 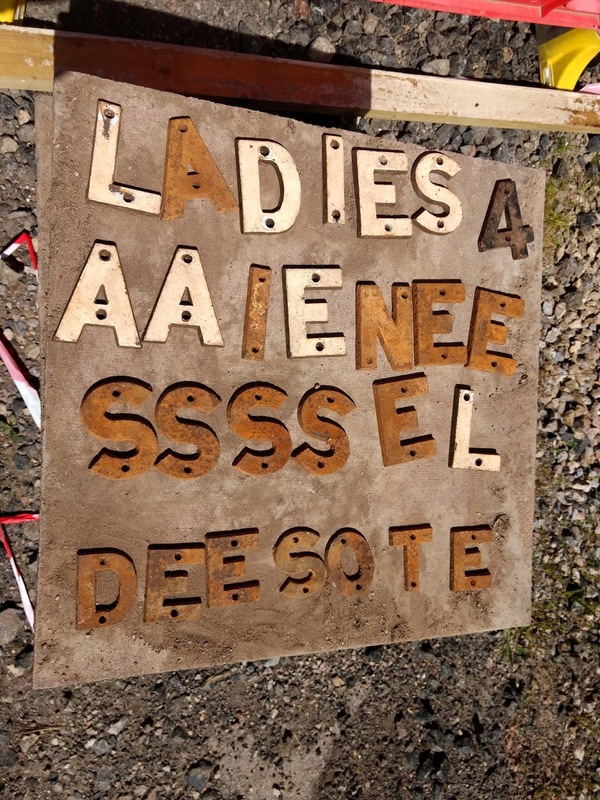 They didn't know what the letters spelled, except you could make out LADIES and SALE. Surely not? These will go towards our GWR alphabet that we trying to assemble, and this little find should allow us to offer a few swaps with other GWR origin railways - anyone interested? 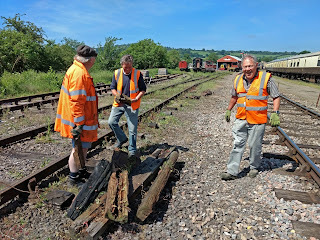 The disposal of leftovers from the relay also allowed us to put to one side some GWR throughbolter chairs for the 2807 society to turn into boot scrapers. 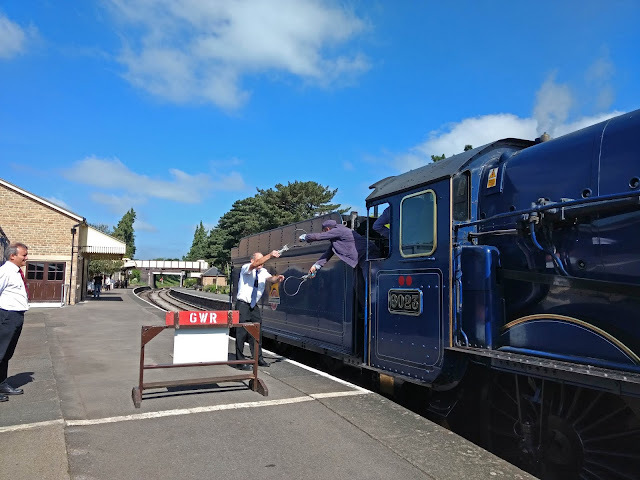 These we took to Toddington, the beating heart of the 2807 bootscraper manufacturing industry. Age imposes a greater frequency for some discreet relief in the bushes as many readers will know from personal experience. Comes the moment out in the sticks, a long way from any toilet. A quick look round to see if anyone is watching? Look left - no one around. Look right - no one around. Dang - forgot to look up ! These C130s are fitted with all sorts of cameras and monitoring gear, aren't they? 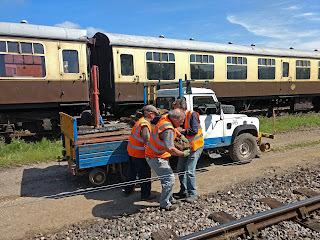 We set of for Toddington in the Landie loaded with throughbolters along the track, the most direct way. 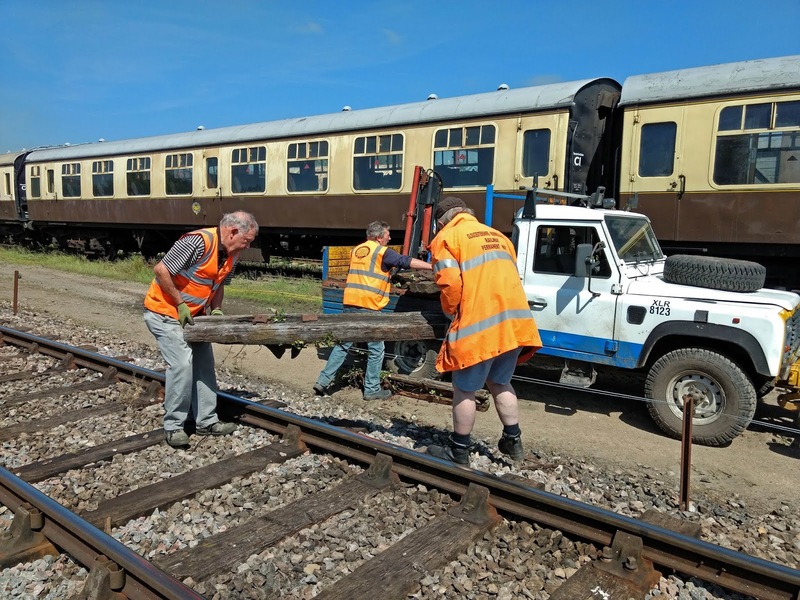 Here is one of the track repair gangs hard at work on the Defford straight out of Winchcombe. The heavy kit is wheeled along in a barrow from site to site. They did 16 clips today, most of them in conjunction with a lifting of the rail to double up the pads. At Toddington, Oliver Cromwell was being loaded, and was soon gone, together with the tender. These people are so quick and efficient. 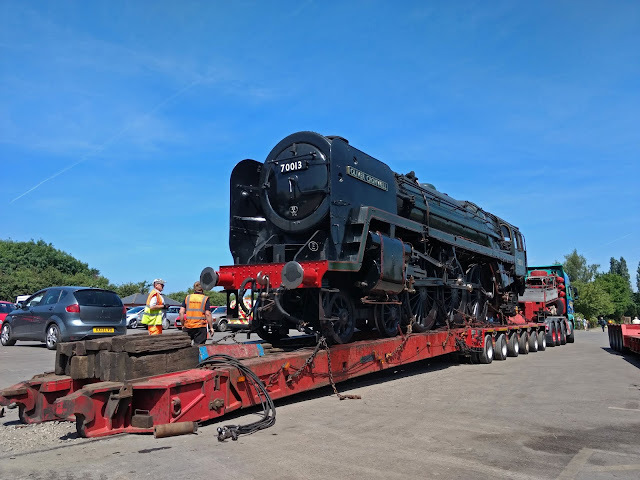 A sad loss, we liked this engine. On the way back from Toddington we stopped to pick up more rotten sleepers, and together with a second trip we cleared the pile on the right. 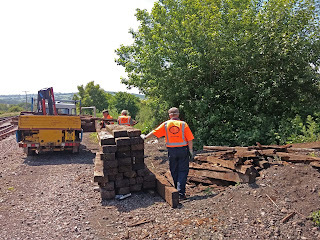 Piles of chairs stacked on pallets will need to be retrieved by more mechanical means at a future date. The numbering starts at each mile post, heading south. It identifies the fishplate, and on the track defect report you can then give the number of sleepers to count back to in order to identify exactly the sleeper at issue. 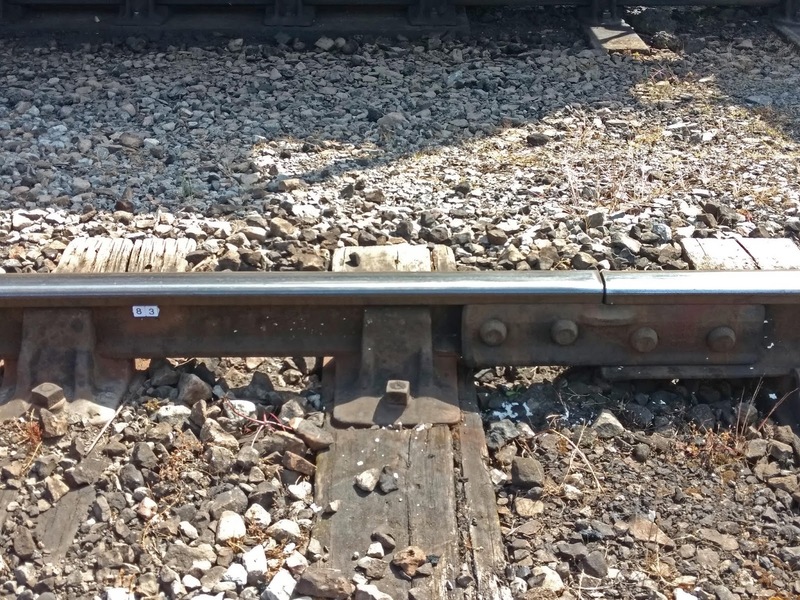 On this subject, it is also worth mentioning that we will have a day of fishplate greasing next Monday, when we will have a possession for the line. 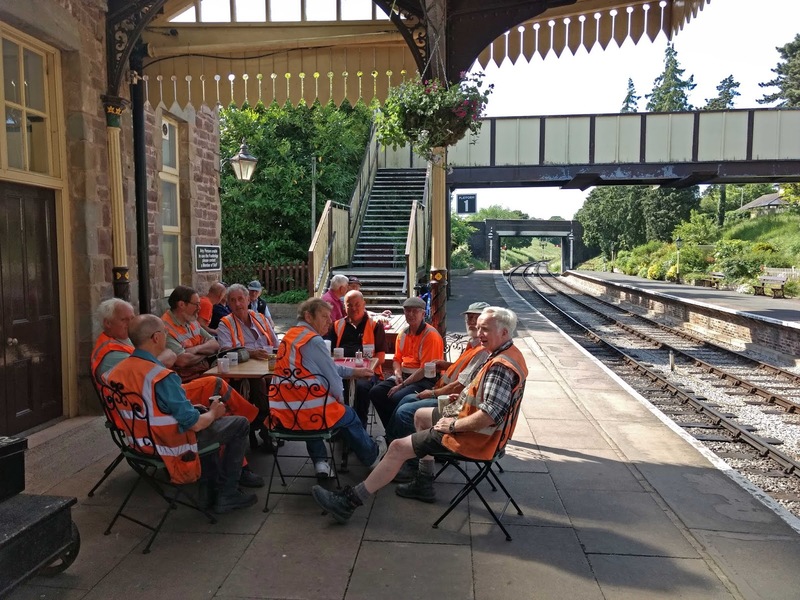 Log on to Doodle is the advice, or rather plea, as we need at least a dozen volunteers to get a move on with this vital piece of maintenance, which always needs a large gang. Then another quick look at King Edward II, one of the last few trips on our railway before he leaves us again. 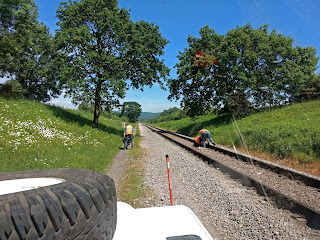 By 16.00 the heat got to us and we cleared up the tools, to relocate the gang to more favourable surroundings. To wit - the Coffeepot. But you already guessed that, didn't you? 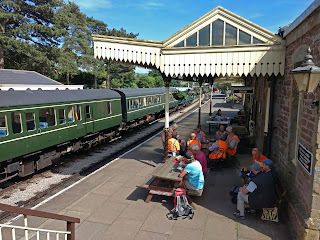 There's nothing like Winchcombe for a tea and a bun, and to watch the trains cross with the two train timetable. See you again on Saturday ! Why pay to go to Spain? 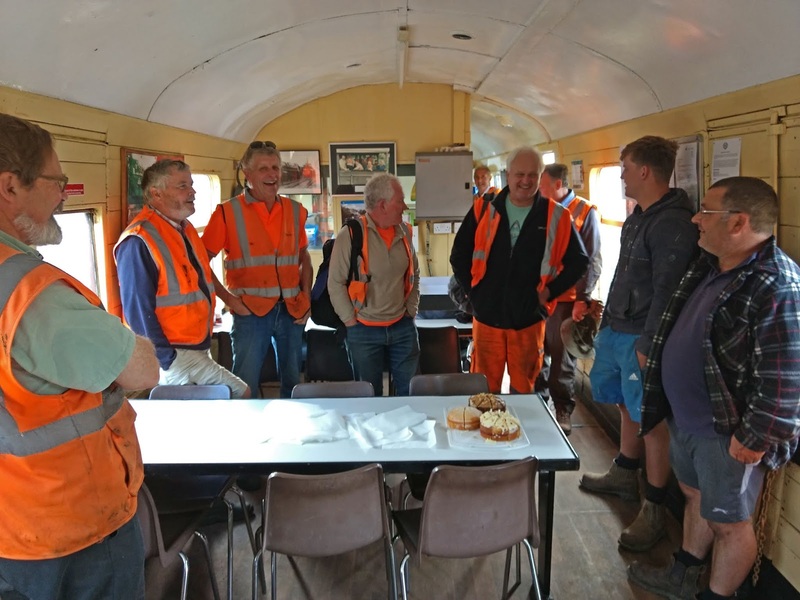 The King is dead, long live - the rail motor? Back to the very old days.